Sometimes Simple is all you need. . .
especially when it comes to basic classic pieces. 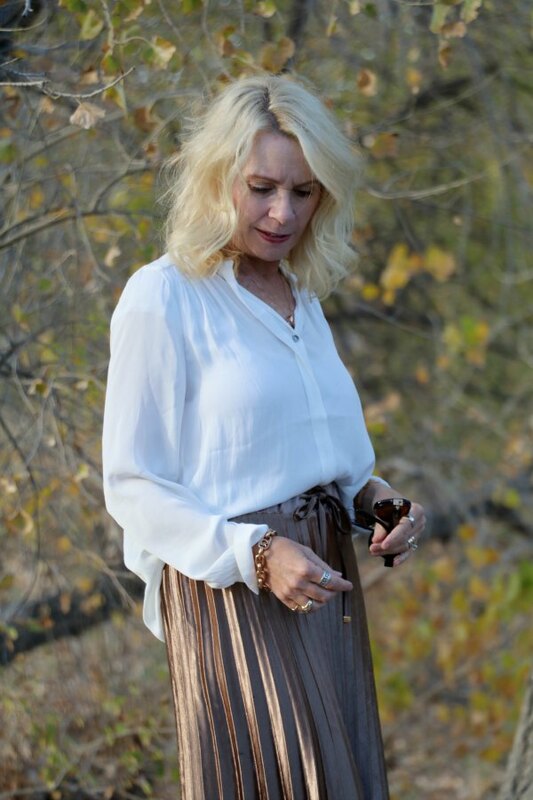 Like a simple cream blouse, a simple pleated skirt, and simple classic pumps. When I walked outside this morning and took in this incredibly gorgeous fall day I was reminded that simplicity and the simple things in life are some of our greatest blessings. And when we take the time to enjoy them, well that’s the true gift! I decided to enjoy every minute of this beautiful fall day and in doing so also decided to keep my outfit simple. And yet when I walked out for our church service I realized that sometimes simple is all you really need. I sure hope you’re enjoying this Sunday my friends . . .
“To express gratitude is gracious and honorable, to enact gratitude is generous and noble, but to live with gratitude ever in our hearts is to touch heaven”. Simple but beautiful. It makes you shine. Enjoy fall my friend. What a lovely skirt! You really inspire me. LOVE that skirt and the quote.